I used to write a crazy amount of book reviews back when I was editor or Sweden’s first (and according to me best and most awesome) book site (no longer online). I wrote so many reviews that I got tired of writing about books for several years, although never too tired to continue reading for fun, thank God! Regular visitors of my blog know I love reviewing books again, now on the topics of this blog: craft, art journaling and creativity. And sometimes I also write reviews of products, when I find something I would like to try out for myself. And this time, I had a huge need to try out some Promarker pens! I added them to my wish list and lucky for me I got them for my birthday this spring. Or maybe not so lucky, because I don’t really like them. 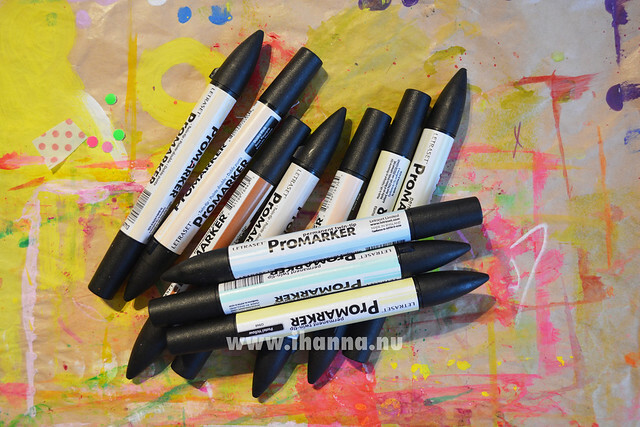 Sorry to all the promarker-fans out there, but it has to be said, because I am honest like that. I know I’ve got a set of pale very subtle colors, and I might have liked more a set of vivid colors … but the main reason I am not a big fan is that they smell, and bleed. A lot. I really like pens that has dual points of the same colors, called twin-tip here. One end is a fine bullet nib for detailing and the other one is a wider, chisel shaped nib for colouring in larger areas. The larger one is too thick for lettering with though. The alcohol based, non-toxic, permanent ink can be used on a lot of different surfaces, like paper, card, vellum, acetate, glass, wood, metal and plastic. Maybe they’re more for crafts than for drawing in a notebook…. Though my biggest disappointment point is the smell of the alcohol! I guess my main lesson here is to be mindful of this in the future, because I’m really sensitive to smells… I will not to get alcohol based pens again any time soon. Have you tried these pens, or similar alcohol based ones? What’s your thought on them? This entry was posted in Draw & doodle and tagged drawing, pens, product testing, review. Bookmark the permalink. I’m sensitive to odors as well and definitely dislike markers that bleed. I’ve never heard of these markers, and I appreciate your review. The Copic brand doesn’t smell and has a lovely brush tip one end and chisel tip on the other. 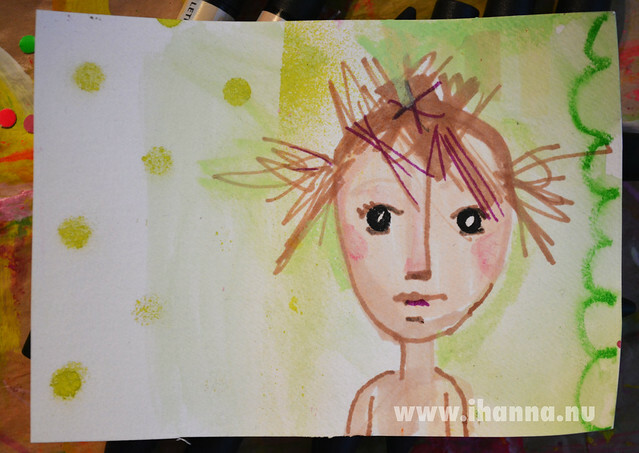 Alcohol markers definitely need special paper such as “X-Press It blending Journal” by X-Press Graph-X Supplies. There’s no feathering and the colors blend beautifully but you will always get bleed through with alcohol markers. I know some artists who use them in their art journals and gesso over the bleed through. They definitely have a place in mixed media art and are great for shading over collage. Teesha Moore uses her Copics for adding shading and depth in her collages. Hope this helps!! Thanks for the advice Kaz, it was helpful! But my main issue is that they smell and I am very sensitive to smells. I think they can be great, just not for me. Thanks for the tips Kaisa! I think bleeding is my biggest issue, I love drawing in my notebooks and they all have thin paper. I only use heavy paper for wet media. I haven’t seen any metallic Promarkers here yet, but I will check if I see them. Um…as for the person who says Copics don’t smell, they sure do! I found them awfully smelly, so much so that after trying one from a friend I never wanted another, because the paper kept smelling of them for days and weeks on end. I do have Spectrum Noirs and they are… okay, still rather smelly,but better than copics (in the smell department). I love how alcohol markers work when colouring in a drawing (as in blending and such), but you have to use them in a special way and always be aware of their ‘agressive’ nature (bleed through, smelly). I usually use them on seperate paper and then paste the image in my journal. And they are handy on top of acrylics and such. I love love love the Pitt pens/markers, espcially the big brush, but they are of a completely different nature than alcohol markers and I wish they would make more colours. 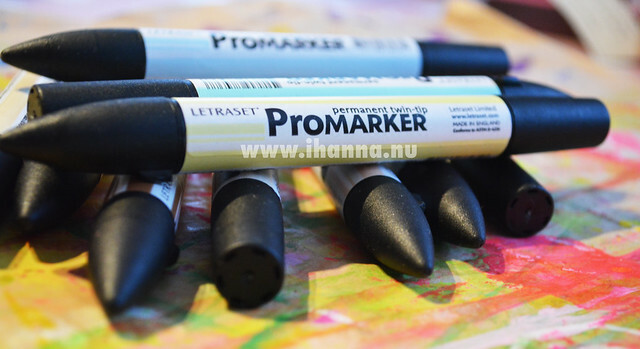 Now, since we’re talking markers, what I would really really like is if Tombow made an alternative to their dual brush markers and filled them with the india ink that is in the pitt markers, so they would be light fast and have those two wonderful tips. Because I love the brush tip on the dual brush markers. I also wish that Pitt would make a drawing pen with the round tip of the Stabilo 68 felt tip pen. I love drawing and doodling with the Stabilo, but it is not waterproof, so you can’t use watercolour with it. So it’s not just me. I never really started using mine…. I think you really should have informed youself before wanting/getting those markers. It is normal that you don’t like them because you are using them completely WRONG. It’s as if you were using watercolours to paint on glass and you were upset because they do not dry well and they go away when you wash the glass. Have a look at youtube channels and blogs of crafters who are using promarkers, they do great stuff colouring images. Promarkers are also fantastic to colour things to later add to creations such as lace or findings. Of course they smell like alcohol because it’s what they are made of, the alcohol you use to clean wounds also smells and it’s a similar liquid. And it is normal that they bleed, that is why you have you use special paper that does not bleed. Then you don’t have that problem. 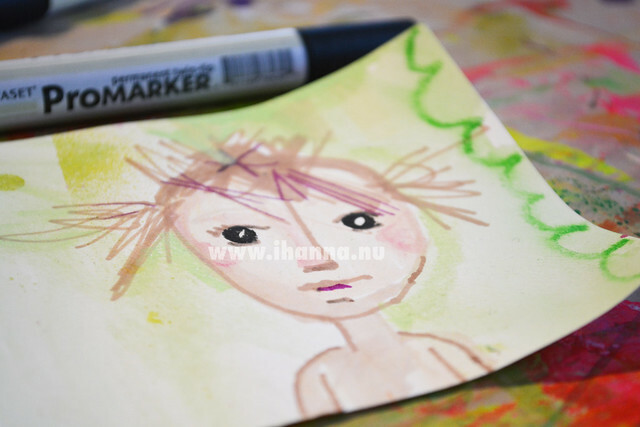 Try using watercolour paints in normal paper that is not watercolouring paper, you will get a fantastic mess :-) Seriously, don’t give up on them! These markers are great, maybe not so much as copics because they are cheaper but they are great for the price you pay and I have seen such beautiful crafting projects with them. I am very new at scrapbooking and crafts and after much reading about the different type of alcohol markers decided to get these, I am learning by watching youtube videos and already love them. You just have to learn to use them and it’s not that difficult. The drawing you did, promarkers are not intended to be used that way, you have to use several to blend the colours together and create dimension. Look, this is one of the first things I made with promarkers and you can see how they are suppossed to blend together. As I said, I am learning, have a look at youtube and blogs to see how truly beautiful images people who know how to use them can make. You will need at least two colours of each colour to blend, which ones did you get? Maybe I can help you to choose colours that can complement the ones that you allready have so that you dont have to spend much to really try them. Hope all this is useful to you and you stop feeling sad for having received them.